Earn $1.53 in Rewards credit (153 points) What's This? Compact and efficient. 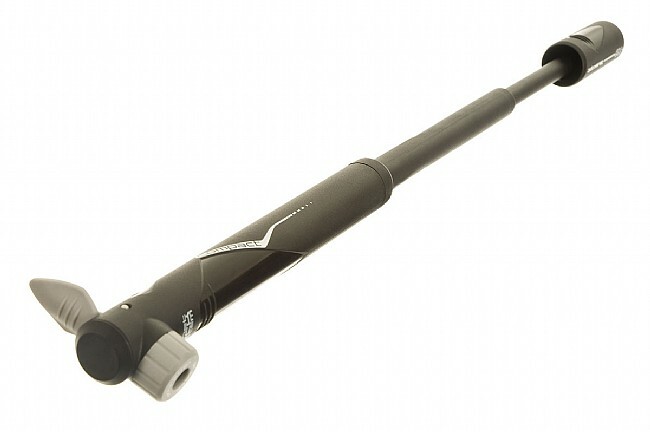 PRO's Telescopic Mini Pump features unique two stage tube which allows the pump to deliver more air per stroke than other mini pumps. To keep weight to a minimum and guarantee strength, the pump is made from glass fiber reinforced nylon. A magnetic lock feature holds the handle in place when not in use. The PRO Telescopic Mini Pump includes a mounting bracket with rubberized security strap. Compatible with Presta and Schrader valves. Black. 114g. (actual weight without mounting bracket). This thing worked at first but after riding in the rain it doesn't work. It doesn't have a cap over the opening and water gets in there. The pump works well. The only bummer is that it's difficult or impossible to install if you have a small frame. Would be nice if they included another option to mount the pump in addition to going off the water bottle bolts. 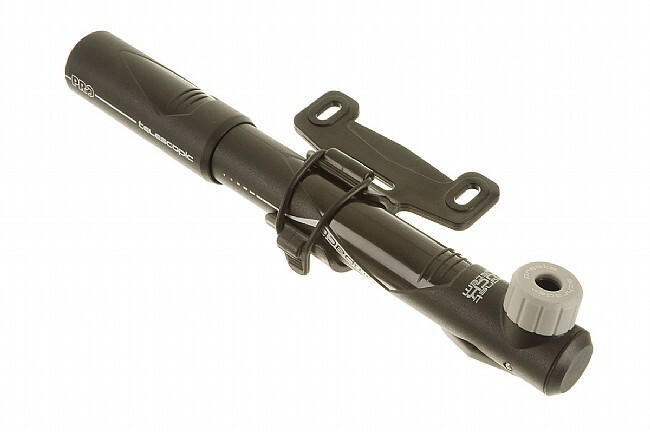 Like the size-rather than on my down tube I attached it to my under-seat bag, It works great and is compact! Liked the size,rather than on my down tube I attached it to my under-seat tool bag-it inflates a tire pretty fast! I keep a pump on my winter bike as a last resort. If the co2 inflators fail or if I help another cycleist on the road. It's cheap. It works. The telescopeing handle you pump less. I use co2 inflators but sometimes they fail. Great for the money. I can't beleive no one has rated this yet. Small enough to fit into a jersey pocket. Telescoping barrel starts off slow but puts more air into the tube the more you pump. Will get you up to a rideable psi. The water bottle cage mount lets you adjust the distance between the pump and the downtube. Magnetic handle, holds handle against barrel, won't bang around and drive you nuts. It's made by Shimano, it that makes a diff. I don't rely on a mini for air. I pac 16g co2 and use a mini to seat the tube and for back-up. In a fix, this pump will get you along on your ride. For the price this pump is a steal.